The horizontal (or lateral) motion in earthquakes create the forces that can be damaging to our wood framed homes. Homes tend to fail in one of three ways - all between the foundation and the first floor joists. First, the sill plate can slide off of the foundation. Second, the cripple wall (or pony wall) can collapse (or rack). Third, the floor joists can slide off of the mudsill or cripple wall. There are a few variations on these themes, but most of our work involves installing structural elements proven to prevent these three types of failure. These standards and methods, developed in 1999 by Seattle Project Impact, are consistent with other building department permit requirements. Insurance providers and structural engineers generally ask that the same methods be used. It is important to note that work must be done on all four sides of the house, but not necessarily every bit of each wall. This first illustration on the right shows the basic structural elements of a house before it has been retrofitted. 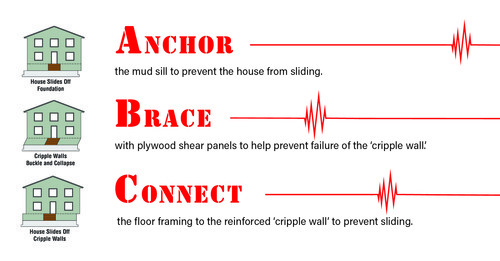 To keep a house from falling off its foundation in an earthquake, seismic retrofit strengthens three different areas of the house. 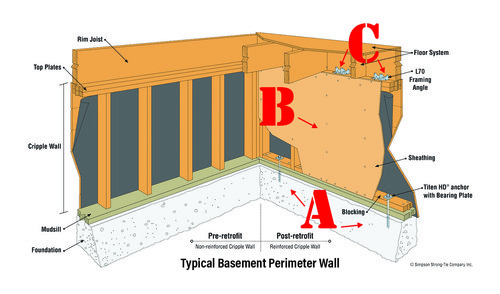 These areas are all located in the basement and/or crawl space as defined in the two terminology illustrations above. If any one of these three areas is not adequately retrofitted, the house will be susceptible to damage in an earthquake. Bracing the cripple walls with plywood. Bolting the braced cripple walls to the foundation. Attaching the floor of the house to the braced cripple walls. The following are simple illustrations to clarify these areas of retrofit. Figure: Damage to a house due to lack of foundation anchors. The base of the house at the mud sill should be anchored to the foundation for obvious reasons. Without foundation bolts or anchors, a house can slide off of the foundation even if its cripple walls are braced with plywood shear panels. Figure 2 shows what can happen to a house if it is not properly retrofitted with plywood shear panels on the cripple walls. Most people are concerned about bolting their house, but history has shown that unbraced cripple walls are the first area to fail in earthquakes, often leaving the residents homeless. If a house is bolted to the foundation, but the cripple walls are not braced, the cripple walls can still easily collapse. 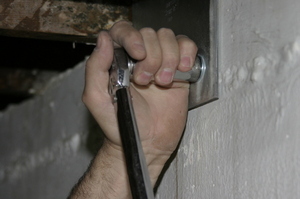 Bolting a house to the foundation without bracing the cripple walls offers very little protection. 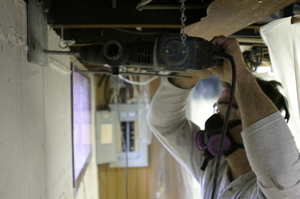 Note that in most crawl spaces and some basements, no cripple walls are present. In those instances, no shear bracing is required. Every member of our team is trained and certified. Experienced with all types of retrofit. Works in conjunction with a licensed structural engineer. Always secures a building permit for retrofit work. Familiar with recent changes to the retrofitting code. Familiar with Project Impact standards. Qualified to address all your structural needs. "One stop shopping" for all retrofit related tasks, including sheetrock & siding. Maximizes dust control, minimizes time disruptions, cleans up properly. In and out in less time than any other contractor. Step 1. 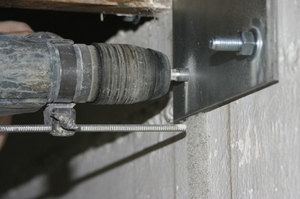 A high powered roto-hammer is used to drill 1/2" diameter holes in the concrete foundation. 2. The final hole is drilled into the foundation wall. 3. And the anchor bolts are driven into place. The number and spacing of the plates are determined by engineered standards.